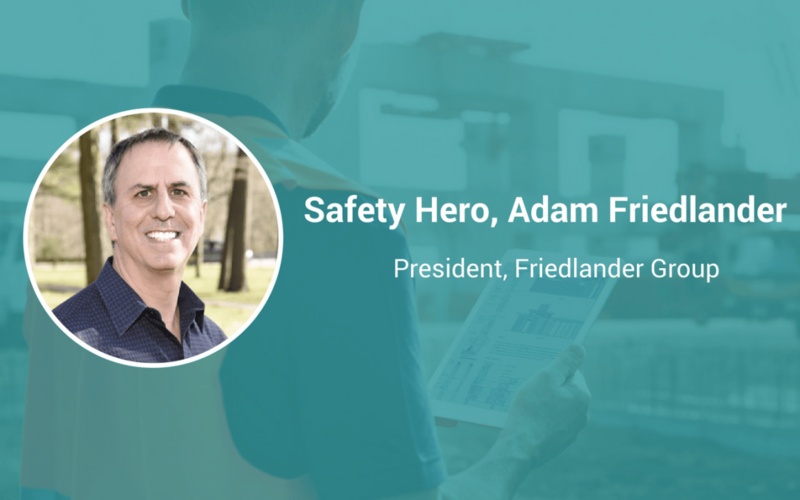 Adam Friedlander is a Safety Hero for many reasons, but one major reason is this: because he’s helped thousands of companies keep their workers safe, healthy, and productive. Friedlander is President of Friedlander Group, where he is able to live out his mission each day by helping clients maximize productivity and profits, by helping them to keep their employees working and safe. Friedlander Group is a leader in workers’ compensation in New York that has been in business for more than 25 years. Its safety groups significantly reduce the cost of workers’ compensation for safety conscious members. Throughout his years helping companies, he says he has learned how there is great power in simplifying safety. He’s also learned the importance of having a strong culture that cares about its people. “Effective safety is the result of the laser focus of Chief Caring Officer, the CEO. If they don’t personally care and lead the safety charge, safety is elusive,” he says. Keep reading to hear his entire story. I am the third generation Friedlander. I brought the firm in a different direction by starting seven safety workers’ compensation safety groups, underwritten by the NYS Insurance Fund. My role is Safety Group Manager. It’s important to find employers that create a culture of caring, that have a laser focus on looking after the safety and well-being of the people that work for them. We have saved members over $500 million in premiums since 1992 by focusing on safety and isolated and eliminating patterns of causes of injury. After reviewing hundreds of companies claims reporting, we produced our own Executive Action Report that revealed to employers their lack of safety, sorted by cause, so they could focus on the most meaningful remedies first. Effective safety is the result of the laser focus of Chief Caring Officer, the CEO. If they don’t personally care and lead the safety charge, safety is elusive. Simplifying complex claims data so that employers can easily make effective decisions to maximize their productivity by keeping their number one asset, their employees, working and safe.